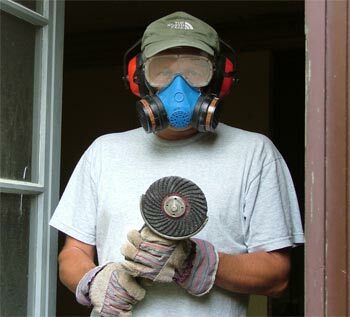 Read Our Roof blog with daily updates of how we are progressing with the major renovation of the roof of our house. A lot can happen in two months. In our house certainly. 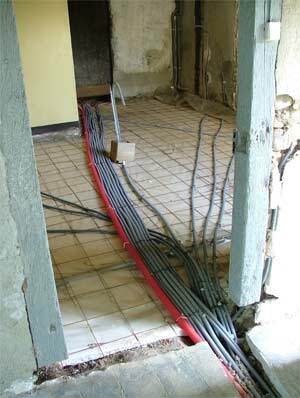 Since we last wrote, the floor of the back kitchen has been filled with cement over all the cables and plumbing. 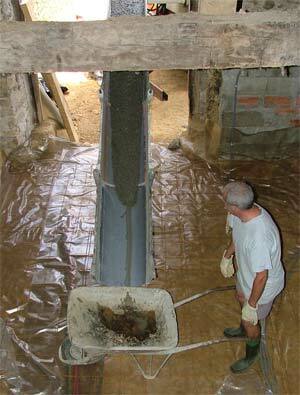 The chai has had a huge amount of cement poured in to create the basis for the new floor. 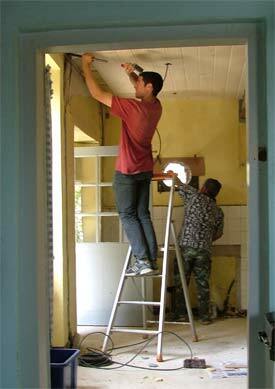 The back kitchen has received a lot of attention in the way of a new door, wall and floor tiles. But we'll let the pictures tell the story. 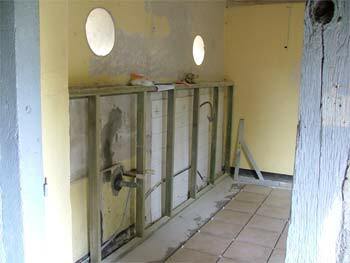 The electrics were laid across the back kitchen on top of the metal grill that will reinforce the cement. The cables will feed the back of the house and the barn, as well as all the kitchen appliances and lighting. The box in the middle is where the island will come. We had electricians, a mason and a plumber working all at the same time to speed up and improve communication between them all. That way, things happened in the right order and many a new idea came out of moments where a decision was needed to proceed. oeil-de-boeuf in the west wall. He also cracked a joke a minute. Now when we are at the sink we can look out at the sunsets. 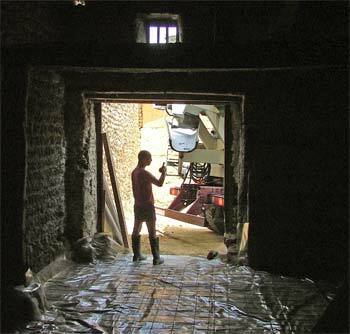 The old wine cave, or chai, was finally floored with 15cms of cement. Perry can install his new studio. Perry takes the honours by receiving the first barrow load of cement. Heavy!! 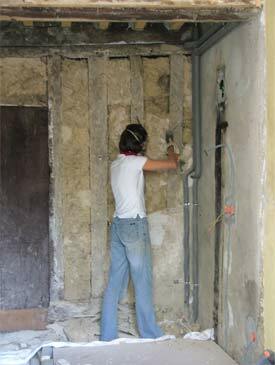 Meanwhile, Caroline was chipping away at the old earth fillings between the old beams. Here, she is in the kitchen. 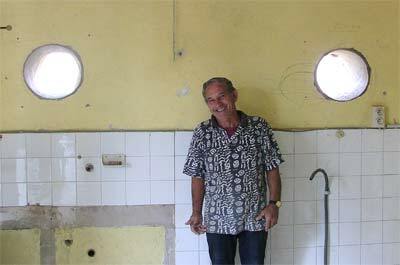 The spaces were refilled with chalk-based bricks and finished with plaster. 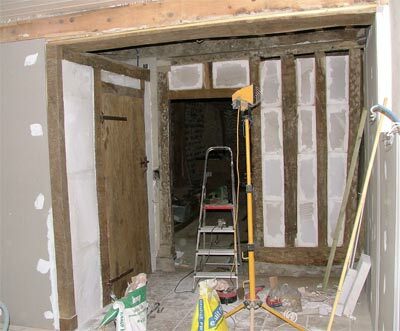 Eventually we will make a mix of earth and water and paint the plaster to create a natural tint. That's Perry under there! The old kitchen had a layer of hard, gloss paint that was a bugger to remove. It had to go otherwise the new plaster would not stick. To save time (and money) Perry took over the job and managed to clear a large section every other evening after the builders had done their stuff. 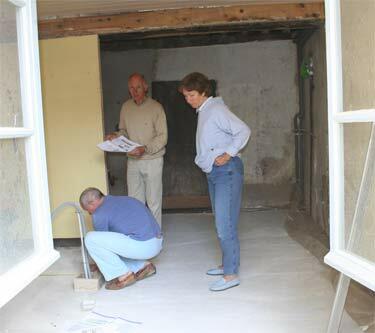 While Peter and Marianne were here, we went over the measurements of the kitchen one more time. Good job too, since we found that some of our ideas were not going to fit. Using chalk and cardboard boxes, we got an idea of the space when it will finally be filled with all the units. Talking of which, we went to Ikea and ordered them all up. Only to discover that the design we had chosen was about to be removed from their range. Just in time! They all arrived, along with the wood for the work surfaces and the oven. If someone broke into our barn tonight they could refit their kitchen completely. Tiles, plumbing and electrics installed. As well as a straight wall to run the units against. There is not one angle in this house that comes close to 90 degrees. All part of the charm. The boiler is now closed in (on the left). We found the old door and the beams in the barn. The vertical timbers (as seen in earlier shot of Caroline) have been sanded, refilled and just need plastering. The ceiling will go in once the upstairs' bathroom plumbing has been installed. Perry's studio is beyond the door. In July, our roof will be taken off and new timbers, insulation and tiles will be placed. It should take about three weeks, so hopefully it won't rain too often. We realise that for those of you who haven't visited us yet that you may not understand where everything is. Bear with us, we will try to create a video tour or some more panoramic views to give you a better overview. But right now, there's a wall to paint, so don't hold your breath!